← UYL – Sourdough September again ! For over three years there has been a Europe-wide ban on bee-harming pesticides called neonicotinoids. But this ban only applies to crops attractive to pollinators — it doesn’t cover crops like wheat. This October, Michael Gove will vote on behalf of the UK, alongside other European countries, on whether to extend the ban to all crops. 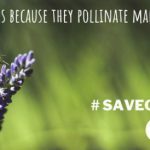 We already know we can save our bees when we take action together. Just look at what happened when you asked garden centres to get neonics out of their ‘pollinator-friendly’ plants. 9 of the top 10 listened to you and committed to ditch them, and we’re still hopeful of completing the set. The science is on our side – there’s more evidence than ever on the need to ban pesticides which harm our pollinators. But the UK government also needs to see how much you’re concerned about this issue. Michael Gove will represent the UK’s position on the matter during the vote. By adding your voice you can make sure he knows why we really care about our bees before he casts the ballot. We need to pile on pressure and make sure he really hears how important bees are to us. To get started, pick a poster template below or make your own by uploading a photo. Then simply finish off the sentence explaining why you think we need bees and share it. Want to see all the reasons people think we need our bees? Have a look at others’ posters in our gallery.